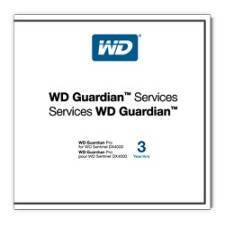 WD Guardian Pro is perfect for users who wish to maintain their own storage server and also get access to WD's Technical Support when extra assistance is needed. Available in one or three year plans, WD Guardian Pro is perfect for users who wish to maintain their own storage server and also get access to WD's Technical Support when extra assistance is needed. Business Hours Technical Support for the duration of the plan. Hardware Support and Express Parts replacement for the duration of the plan.